PAMELA: Poor Niagra! 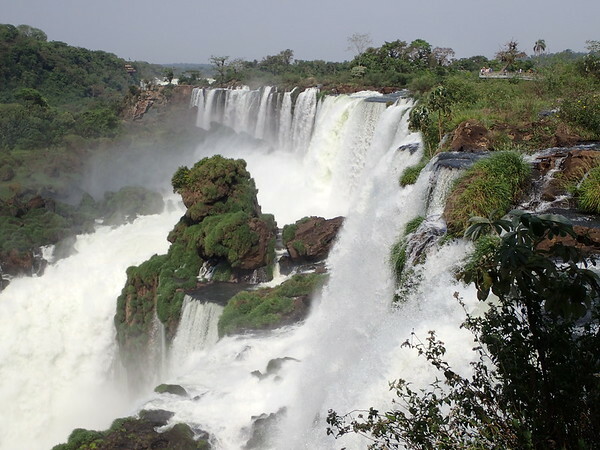 Eleanor Roosevelt exclaimed upon seeing Iguazu for the first time. I couldn’t have said it any better. They are magnificent and awe-inspiring! 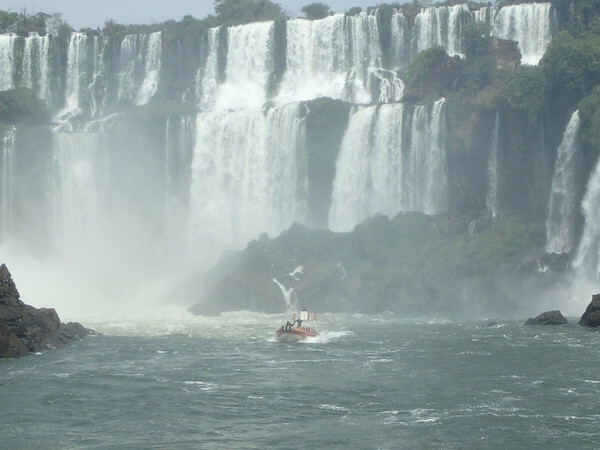 The Falls of the Iguazu River are the largest waterfalls system in the world and tumble along the border of Argentina and Brazil. 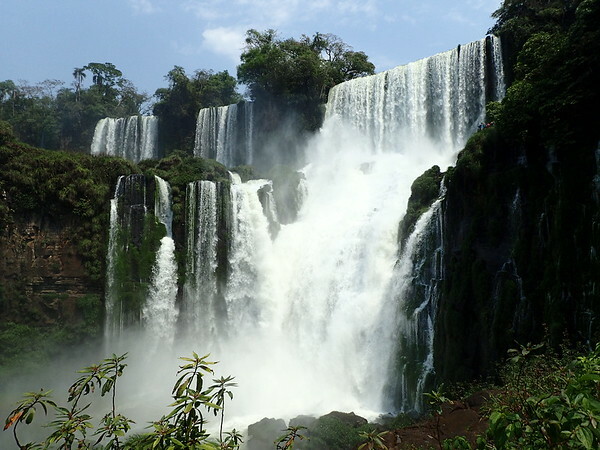 The Falls occur 14 miles upriver from the joining of the Iguazu and Parana Rivers. 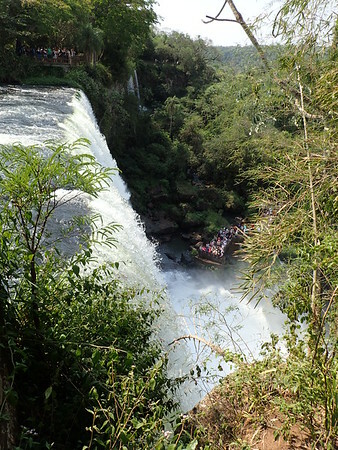 Numerous islands along the 1.7 mile long waterfall divides the falls into many separate cataratas (waterfalls) – between 150 and 300 – depending on water level. 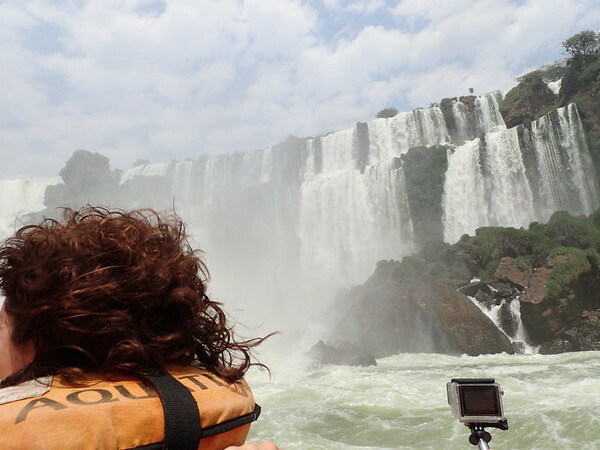 There are viewing areas in both Argentina and Brazil, but you can get up close and personal only on the Argentina side. 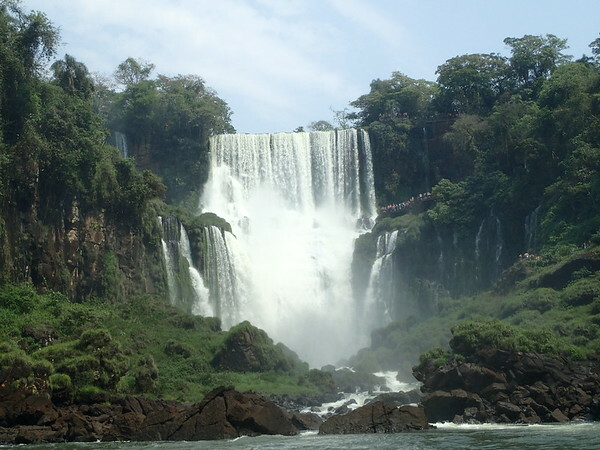 The falls are shared by two national parks – both designated as UNESCO World Heritage Sites. 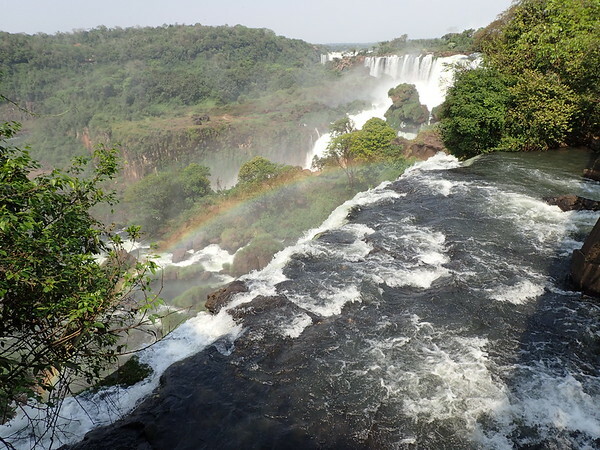 Lucky enough to snag a room at the only hotel within the Iguazu National Park, we were greeted by an amazing view. 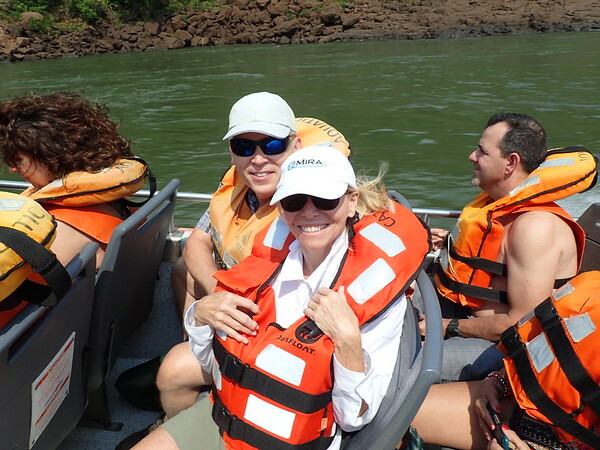 Ready to experience the much talked-about boat rides under the Falls, we signed up and headed out! 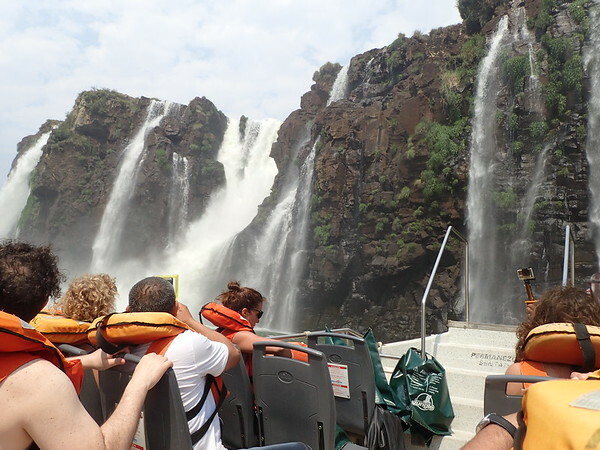 After watching boat after boat careen under the massive falls, I was not too sure about this tourist attraction. But, what the heck. A little hair raising, and we got drenched as advertised! But, so worth it! 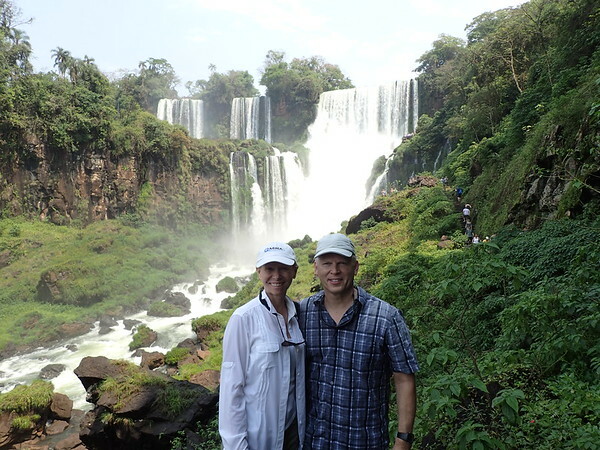 We got so close to some of the smaller falls – we could almost touch the cliff face! Our boat getting ready to drive under the Falls! 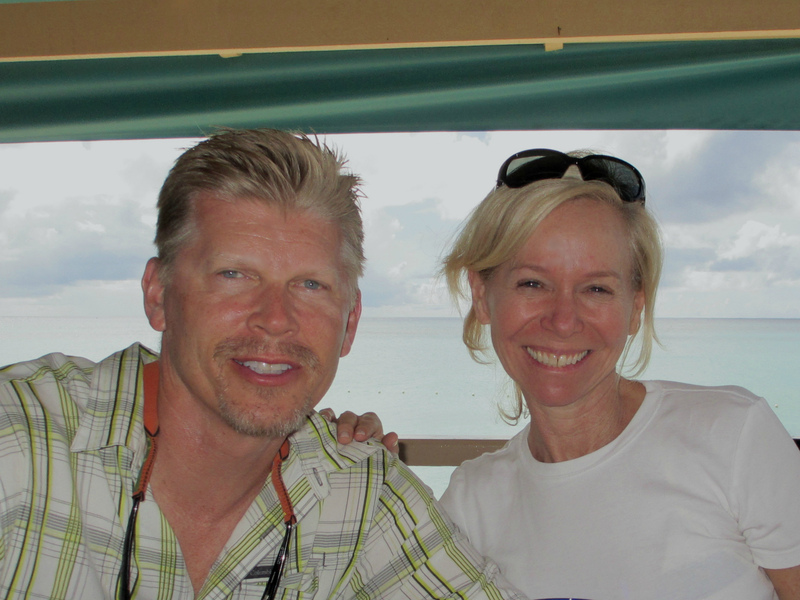 The next day and a half were spent hiking in the steaming humidity of the rainforest climate. We climbed along the metal walkways that crisscrossed through the National Park in search of the best view of the magnificence. It was truly breathtaking to be so close to the Falls. Every vantage point did not disappoint!